Data has made it quite evident that riding a motorcycle has become an increasingly perilous pursuit in the United States, with the most recent information showing that motorcycle fatalities are on the rise in this country. But studies show that the unwelcome numbers look even more dispiriting once one factors in alcohol-impaired driving on the part of at least one of the parties involved in a crash, and the alarming statistics are the continuing concern of San Francisco motorcycle accident attorney Gregory J. Brod. The risks to motorcyclists were on display in a high-profile and most unfortunate way last week and particularly this weekend when two motorcyclists died in two separate incidents on the same Oakland freeway. According to the San Francisco Chronicle, the most recent incident involved two motorists who were arrested on suspicion of drunken driving after the rider of a Harley-Davidson motorcycle got into an altercation with one of the motorists on Interstate 880, with the motorcyclist crashing into a different motorist. The collision with the second vehicle, a pickup truck, caused the latter to burst into flames and the death of the motorcyclist; investigators are still trying to figure out the exact sequence of events. The fatality was the second suffered by a motorcyclist on I-880 in less than one week, as another motorcyclist died Thursday when crashing his Harley-Davidson into the rear of a big-rig truck on that interstate. While police suspect that alcohol was a factor in one of the last week’s crashes involving a four-wheeled motor vehicle and a motorcycle that resulted in the death of a motorcyclist, by at least once measure the numbers for alcohol-impaired driving of motorists have been gradually improving over the last four decades. Indeed, according to statistics from the National Highway Traffic Safety Administration, the percentage of weekend nighttime drivers with a blood alcohol concentration above the legal limit of 0.08 g/dl has dropped from 7.5 percent in 1973, to 5.4 percent in 1986, to 4.3 percent in 1996, and to 2.2 percent for the most recent survey conducted in 2007. Unfortunately, the figures for motorcyclists have not been as encouraging. 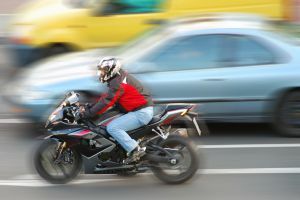 NHTSA statistics show that in crashes in 2008 a higher percentage of motorcycle riders had a BAC above the legal limit than any other type of motor vehicle driver, with motorcyclists accounting for 29 percent of those within that category, as opposed to 23 percent for passenger cars, 23 percent for light trucks, and 2 percent for large trucks. Forty-three percent of the 2,291 motorcycle riders who died in single-vehicle crashes in 2008 had BAC levels at or above the legal limit. Even worse, 64 percent of those motorcyclists killed in single-vehicle crashes on weekend nights had BAC levels at or above the legal limit. In fact, motorcyclists who died in traffic crashes at night were nearly four times more likely to have BAC levels at or above the legal limit than those killed during the day, with the numbers registering at 48 percent and 13 percent, respectively. When taking a look at overall traffic fatalities involving a motorcyclist, an estimated 148,000 motorcyclists have died in crashes since the enactment of the Highway Safety and National Traffic and Motor Vehicle Safety Act of 1996. Using per-vehicle miles travelled in 2007, motorcyclists were about 37 times more likely than passenger car occupants to die in a motor vehicle traffic crash and nine times more likely to be injured. These figures are very troubling to us, and if you or a loved one has been injured or killed in a motorcycle accident, please contact the experienced attorneys at the Brod Law Firm for a free consultation.